APPLICATION DEADLINE: November 11th, 2018 at 11:59 PM. Please submit a cover letter, CV, and multimedia portfolio in one PDF file to Mark Underwood at ceo@safconcordia.ca. The interviews will be conducted on the weeks of November 12th and 19th. Applicants will be selected using pre-established criteria set by our Board of Directors Human Resources Committee. 10-15 hours per week at $15-$17/hour. Coordinators receive a cost of living increase upon renewal of contract in addition to a performance increase up to 5% depending on peer evaluations. The Sustainability Action Fund (SAF) is a student run fee levy group at Concordia University. The organization collects approximately $205,000 of revenues a year from undergraduate (25-cent-per-credit) and graduate ($1.25 per term) fee levies. The majority of funding goes to support projects to develop sustainable infrastructure, urban agriculture, community-building, and education surrounding environmental and community issues, with the long-term goal of inspiring and developing a culture of sustainability at Concordia University. 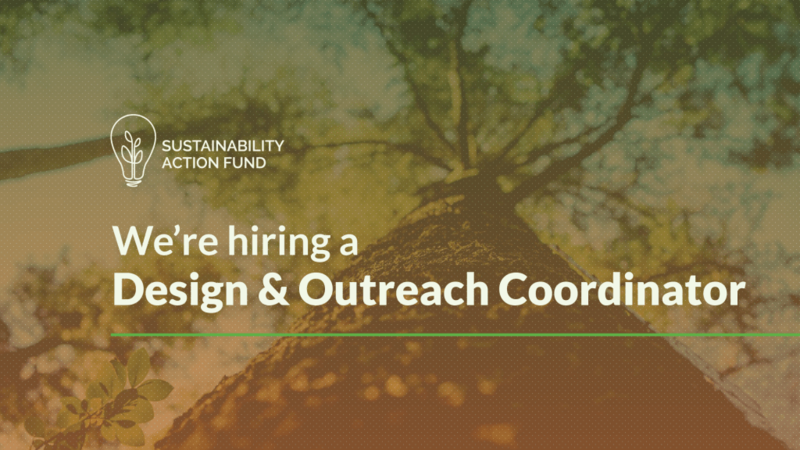 The successful candidate will work closely with the SAF executive team and members of the Board of Directors to design, produce and maintain promotional tools & strategies to mobilize students interested in or in the process of applying to the Sustainability Action Fund.